I have just baked these to put in lunchboxes for tomorrow they taste amazing and the topping doesn’t have an artificial taste its sweet and cinnamony I will definately buy these again! Very easy to make, no oil needed like a lot of other muffin mixes, a yummy snack to add to my kids school lunch boxes. Betty crocker make some really great dessert/snack products like cakes and muffins. These muffins are really great when they come out of the oven, so soft… but really don’t like the cinnamon in them – it’s too strong or something. I love muffins for breakfast, morning tea, afternoon tea and as a snack. These delicious muffins by Betty Crocker and simply so delicious and have a terrific cinnamon flavour and the top has a wonderful crumbly texture. Perfect with a scoop of ice cream. 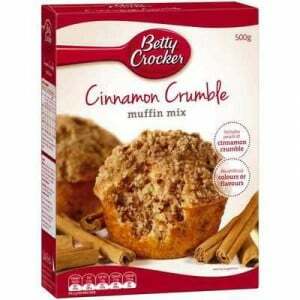 By co-incidence I enjoyed one of these Betty Crocker Muffin Mix Cinnamon Cumble muffins this morning for morning tea. Personally I shake off a lot of the cinnamon crumble, but otherwise it’s a delicious tasting muffin. How would you rate Betty Crocker Muffin Mix Cinnamon Crumble?